There has been condemnation from across the political spectrum of the violent clashes between protestors and gardaí in Dublin city centre this afternoon. 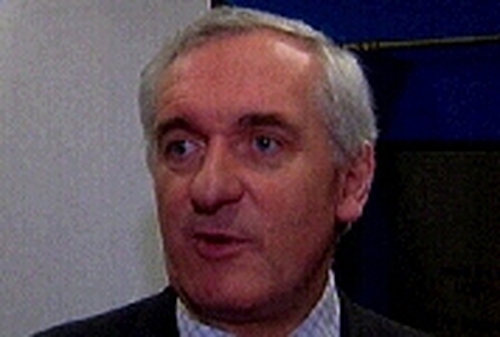 The Taoiseach, Bertie Ahern, said it appeared that dissident republican elements, as well as local people, were responsible for the disturbances. Mr Ahern said there had been word in his Dublin Central constituency last night that trouble was likely. He said that gardaí had been assured by the contractors that a construction site on O'Connell Street, where implements were used as missiles, was protected but that in the face of determined rioters that proved inadequate. Fine Gael leader Enda Kenny said there were implications for the peace process and the re-establishment of the Northern Assembly. And the Labour leader, Pat Rabbitte, said the Justice Minister, Michael McDowell, should make a public statement, based on a garda report, about whether reasonable steps were taken to ensure that this kind of mayhem could not be created. Meanwhile, Mr McDowell has condemned today’s protests. He said the riots were 'inexcusable' and 'an organised vicious attempt to discredit democratic protest'. He refused to criticise the reaction of gardaí. Mr McDowell said there was a strategic decision to deploy 200-300 gardaí and that there was no identification in advance that violence would occur. He thanked the gardaí for their courage in the face of 'intolerable provocation'. Sinn Féin TD Sean Crowe said the riots were a set back for republicanism and there was a small minority element intent on causing mayhem in the city. Jeffrey Donaldson of the DUP, who was in Dublin today for the march, said he was 'appalled' by the violence. Mr Donaldson led a DUP delegation that met with the Justice Minister this afternoon. 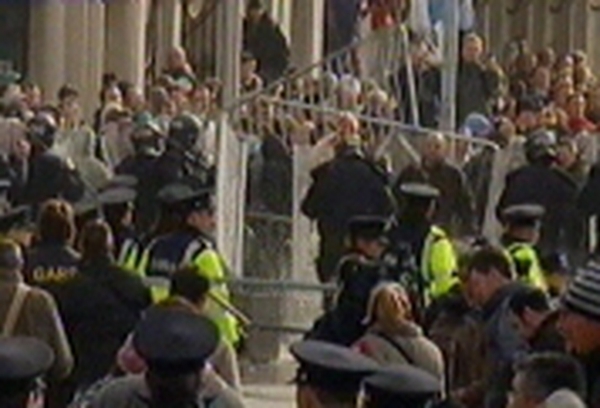 Business groups say the riots have injured Ireland's international reputation. The head of the Dublin City Business Association, Tom Coffee, said those responsible for the violence are a disgrace to a Republic that is about democracy and tolerance. Dublin Tourism's chief executive of Dublin Tourism Frank Magee described today's events as 'shocking' and 'quasi terrorism'.